International Conference on Biomarkers and Clinical Research : Vydya Health - Find Providers, Products. 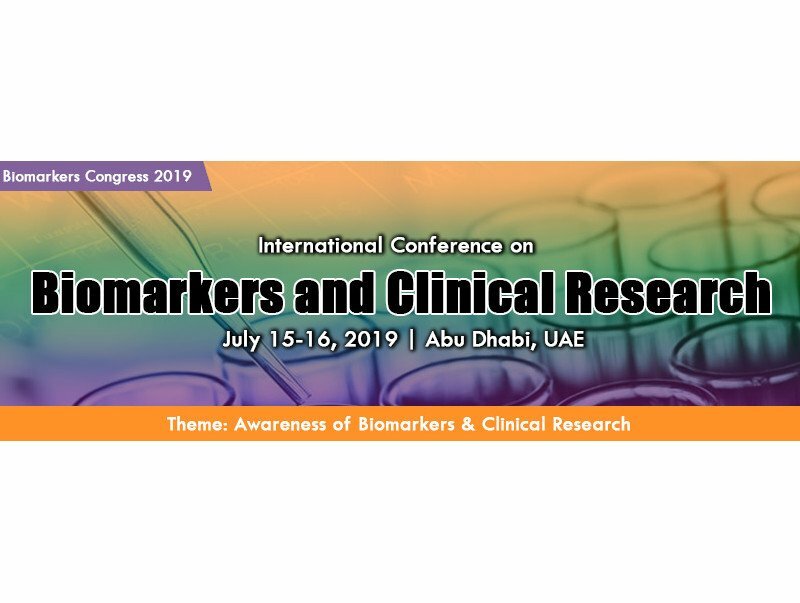 We are pleased to invite you to the “International Conference on Biomarkers and Clinical Research” which is slated to be held at Abu Dhabi, UAE during July 15-16, 2019 around the theme “Awareness of Biomarkers & Clinical Research”. It covers topics such as Biomarkers, Clinical Biomarkers, Advance Biomarker Research and Testing, Cardiac Biomarkers, Genomic Biomarkers, Neurological Biomarkers, Immunological Biomarkers, Biomarkers in Pharmacology, Biomarkers in Oncology, Biomarkers in Drug Discovery & Development, Clinical Research, Biomarkers and Nanoparticles, Clinical Trials. Our Conference will provide a perfect platform addressing: Laudable talks by the top-notch scientific community, sterling workshop sessions, Remarkable Awards and Global Recognition to meritorious Researchers, Global Networking with 50+ Countries, Novel Techniques to Benefit Your Research, Global Business and Networking Opportunities, Exquisite Platform for showcasing your products and International Sponsorship. Join Biomarkers Congress-2019 and spend few days in amazing city of Abu Dhabi.